Quick to heat, convenient product. I love it so much! I lost count on how many times my coworkers have asked where did i get it from.. I bought this for my husband so that he could have a hot lunch instead of a cold sandwich all the time. He drives a feed truck and travels all day and doesn't have time to stop and eat a sit down meal. This lunch box works GREAT for his meal. 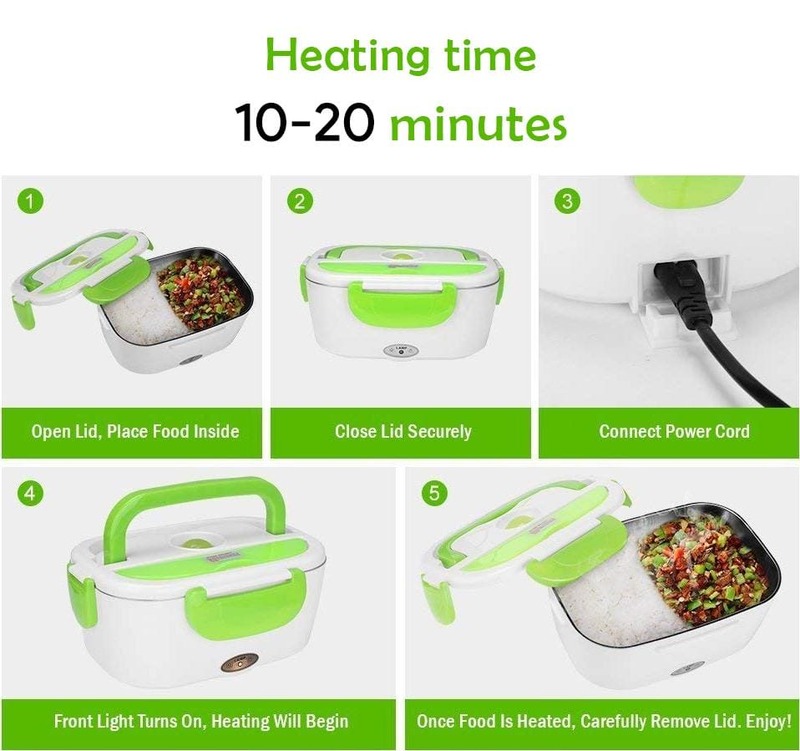 He plugs it in about 20-30 minutes before he gets to his next stop and while he is unloading, he is able to eat a hot meal. Sure beats a cold sandwich!! I would recommend this lunch box to anyone who travels a lot through the day and doesn't have time to sit down at a restaurant or can afford take out all the time. Husband loves it. Warms up his meals & keeps it warm. While drivin in ambulance instad of always havin sandwiches. I am a long distance truck driver. Got this took it on my first trip. It worked wonderfully had all my meals prepackaged and within 20 minutes of putting them in there they were nice and hot. Great product and I love it and would recommend it to all my driving friends. Great idea. It gets warm quick and I love that one section is removable with a lid. The spoon compartment on the lid is also very handy! Bought it for my husband as his lunch box. It warms up his food as advertised, sometimes a little too well. He ABSOLUTELY loves it. He has recommended it to his co workers. He also informed them where to buy it. Very happy customer, thank you.